Given the increase in importance of digital marketing activities to reach and influence our audiences, we have naturally seen the creation of new roles in businesses to manage them because of the specialist skills needed. You can't manage or control search marketing or marketing automation if you don't have specific skills. Given this, many larger organisations have seen silos develop where activities like digital marketing as a whole or specialist channel activities like Paid and natural search, email marketing (and marketing automation) or social media marketing form separate teams. It's often the case that there will also be separate specialist agencies working on these activities since specialist agencies have the specific experiences and trained staff to maximise returns from each channel. Larger organisations will potentially also have separate teams for traditional media covering corporate communications, brand advertising and direct mail where digital transformation programmes haven't progressed to implement them. Which core digital marketing activities should you focus on? With consumer and businesses consumption of digital and social media continuing to increase, both on desktop and smartphone, it's important to develop the right skills, but how do you assess which are right when there are now so many digital and traditional media channels - this list of today's marketing channels by David Sealey lists over 120! To help make the identification of skills and planning activities simpler I have narrowed this down to 8 core digital marketing which demand special attention. Here's a visual which will feature in the new edition of my Digital Marketing Excellence Book (written with my co-author PR Smith). In smaller businesses, one person or agency may manage all of these and in larger organisations or agencies there could be multiple people involved in each depending on business sector. Each needs to be included in plans and then optimised given the many success factors and best practices needed as the platform players like Google, Facebook and the other social networks change the rules by introducing new features. 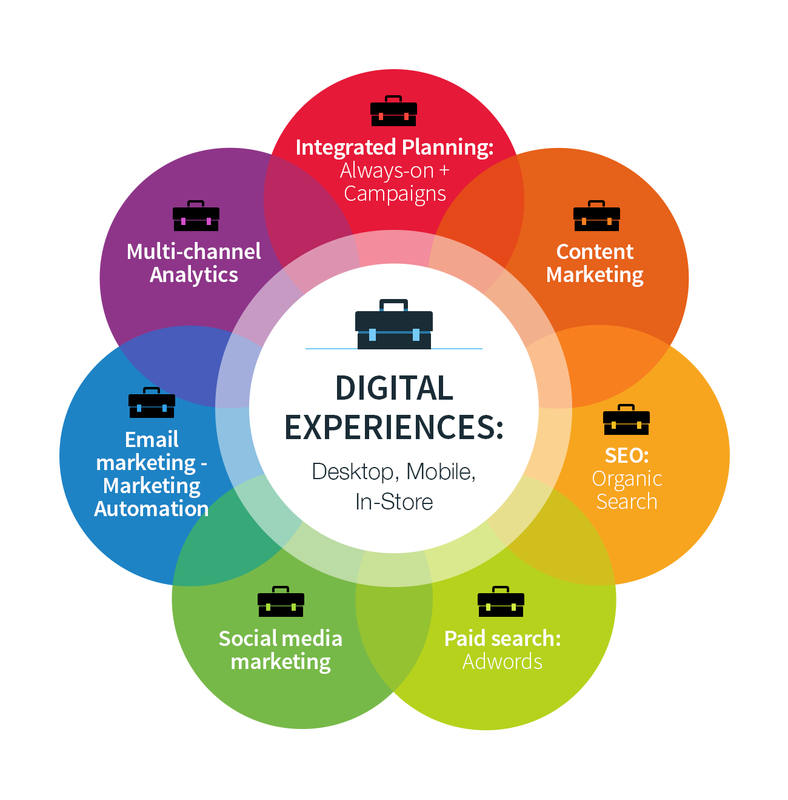 Digital Experience Management – Traditionally the company website has been at the heart of online marketing, but today, companies need to think of a broader customer experience to enable interaction across desktop and mobile devices, mobile apps, social media company pages and email marketing. For multichannel businesses such as retailers, financial services and travel companies, there are also great opportunities to offer in-store digital experiences such as the virtual and augmented reality techniques and offer web-self service. Digital marketing strategy and planning – Research shows that many businesses are doing digital marketing, but without a strategic, planned approach. If that's the case, you will run into the problems above of lack of integrated communications. The PR Smith's SOSTAC® planning system is an excellent way to create an overall integrated marketing plan across paid, owned and earned media that includes not only campaign activity, but also sufficient focus on ‘always-on’ activity to get visibility across search engines and social media . Content Marketing - I think of content marketing as the fuel for all the core digital marketing activities to engage and persuade your audience. Content is the glue that links digital media for content distribution with the digital platforms where it is consumed linked to conversion customer journey. Leading businesses develop a more strategic approach to content creation, repurposing, advertising and outreach. It's often best to start your plans with how to use content marketing to meet your campaign goals by engaging audiences through content, before drilling down into the channels. Search Engine Optimisation (SEO) - If you get it right, SEO can be a huge competitive advantage in many business sectors where prospects are looking for brands, products and solutions. To get visibility you need to rank highly in the organic search results pages (SERPs) for the search terms your users are looking for. So, it's super-competitive and essential your search specialist or agency knows about the fundamental techniques and the latest changes, currently Google's new Mobile-first indexing. Paid search marketing and other Programmatic advertising. For similar reasons, paid search marketing is highly competitive in all sectors. With Google dominant in many countries, Google AdWords needs careful management, integrated with organic search and also including reaching web users via re-targeted online advertising through the Google Display Network ads or Programmatic advertising to deliver a return-on-investment. Social media marketing. Social media is popular with consumers and marketers alike since it offers many visual opportunities for sharing of ideas, contents and brand recommendations. In 2017, the free options may be reducing compared to the paid advertising. But a focus on using social media for customer acquisition and retention and social media customer service should be part of planning for all businesses today. Email marketing and Marketing Automation. When visitors are away from your website or app, Email marketing is still the best way to deliver targeted, relevant messages to prospects or customers. Marketing Automation takes it to next level so that email and web personalization can use the ‘sense and respond’ approach. Multichannel Analytics. Digital Analytics from services such as Google or Adobe Analytics is just part of the Business Intelligence that helps fuel analysis of business results and performance. These are great tools, but as we describe in Chapter 9, to get the most from them and so get more commercial value from them needs careful setup, a review process incorporating direct from customer insight to encourage optimization. So, those are the eight areas of focus for digital marketing, I look forward to updating you on the major changes we see in these areas across the year ahead on the clickthrough blog.